The silver dollar marks the 150th anniversary of Toronto. 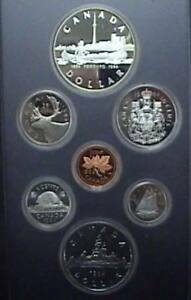 The reverse depicts an Indian in a canoe in the foreground and the skyline of Toronto in the background. Applicable taxes extra if shipped to Canadian addresses. Please contact us for totals prior to sending payment.